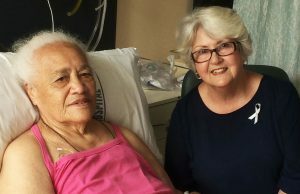 Hospital Chaplain, Margaret Maurice visiting a hospital patient. Parishes throughout New Zealand are being encouraged to mark the 2019 World Day of the Sick on 11 February through prayer, reflection, anointing of the sick and a pastoral response to acknowledge care givers. St John Paul II instituted World Day of the Sick in 1992. Since then it has been celebrated all over the world on the feast of Our Lady of Lourdes on February 11. The day of remembrance is also observed with a special celebration in a particular place, nominated by the Holy Father. This year it will be the city of Kolkata, India. ‘You received without payment; give without payment’ (Mt 10:8).